Summit gathers earth satellite images and other map data from numerous sources, and combines the data as needed for each 3D map project. Map content such as roads, borders, boundaries, place names, etc., is added selectively to provide functionality to the maps. Satellite earth images are chosen based on the necessary resolution, visual attractiveness, seamless integration of multiple input images, and appropriate natural color balance. We do additional color balancing and digital processing, as necessary. The resulting earth images give a sense of viewing the earth from space on a cloudless day. Next, we define the earth’s terrain using input from one of several digital elevation models (DEM). Remarkably accurate DEMs are available for much of the globe. 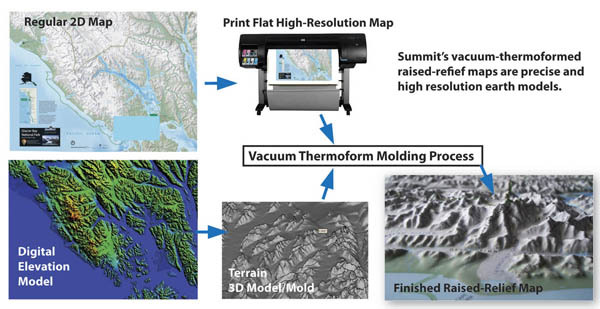 These 3D models are then used to create terrain molds using a Summit Terragraphics proprietary tooling process. The high-resolution image is first printed in 2D on a flat rigid plastic sheet, and then vacuum thermoform molded to provide the 3D terrain shape. The molded map is then prepared for viewing in a variety of ways – poster style or mounted on foam board and framed. Individual maps can be printed and molded up to 50" x 35" in size. Larger wall maps can be created by printing-molding separate tiles and piecing them together into a larger map. Our printing process uses the latest digital wide-format technology and provides stunning resolution. As with any printed product, care should be taken to protect the surface from scratches or abrasion, and from direct sunlight exposure. Our maps will last for many years in a normal indoor environment.